paper bag & string: Private, Comfortable Cottage For Your Cat! Private, Comfortable Cottage For Your Cat! FOR SALE: Inviting rustic Canadian cabin with faux bois facade, roomy one story, cathedral ceiling, 3 circular windows, customization encouraged. A lovely, affordable kitty retreat. 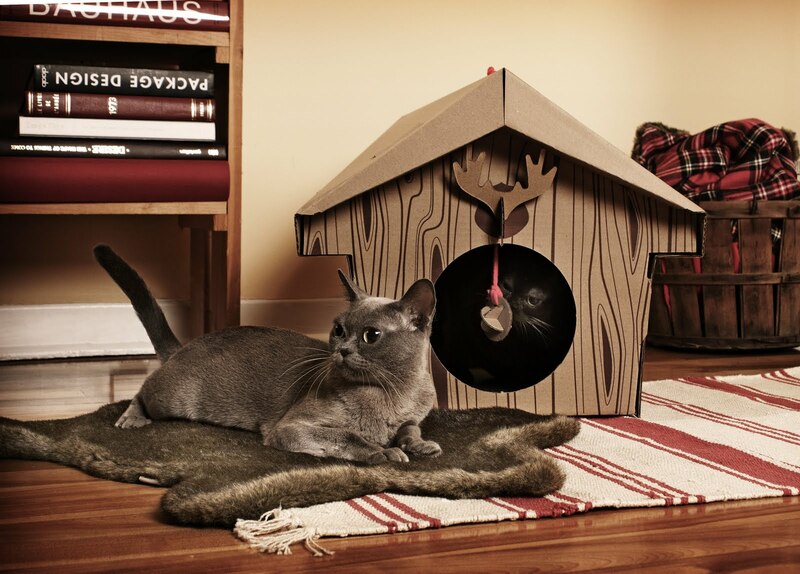 Your beloved cat can take a well-deserved, year-round vacation in this cozy Canadian Cabin designed by Loyal Luxe. 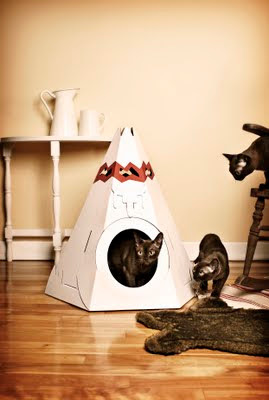 That's right, your kitty will love this adorable, environmentally-conscious cottage, he can call his own. The one floor, recycled-cardboard cottage ships flat to you and is easily assembled. It is recyclable. 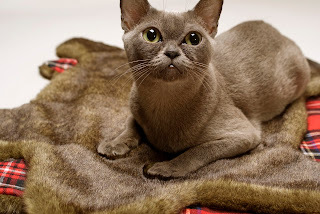 Your cat can custom decorate the fake wood facade of the cottage with 4 interchangeable ornaments including--an antler, a fish, a bird and a banner to write down his name. Plus there are 3 cardboard balls to hang from the doorway. If kitty is a do-it-your-selfer, he can embellish the exterior of the cottage (paint, collage, etc.) to personalize it. The cottage has 3 rear circular windows and a textured cardboard carpet for the interior. The sturdy cottage can support the weight of 30 pounds. Kitty relaxing on the faux bearskin rug. To complement the decor, your kitty will be pleased with this luxurious, 100% synthetic brown or black "Bearskin" rug by Loyal Luxe. The top is comfy faux fur and the back is a red plaid print. For kitties more interested in western style living, Loyal Luxe also offers a Native American Teepee. The teepee comes with 6 interchangeable ornaments: the dreamcatcher, the feather, the tomahawk, the eagle, the bull's head and the banner to write the owner's name. Loyal Luxe was established by Maud Beauchamp and Marie-Pier Guilmain, two Canadian industrial designers. They believe animals and their owners deserve products that are "refined and modern in design." We all know kitties love cardboard boxes. But why should your cat settle for a cheap box home when he can own a lovely cottage! How adorable! Leia would prolly luff the cabin. She was always in her pop tent out on the porch. When we still had one. OMG I am dying from these!! I want everything!! (of course!!! )....this is killing me! I love everything but I am super partial to the cabin and the rug. I have to check these out....maybe for Cody's "Gotcha Day" in July???? I just subscribed to their newsletter, thanks so much for introducing them to us! Your cat is just so darn beautiful. And cool digs! Oh how adorable!! I would love to see my kitties vacationing in the cottage!